You are here: Home / Blog / SHINE! 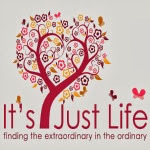 Today I am thrilled to share my blog with author Jackie Cangro. I first found Jackie through a mutual blogger and started to follow her posts. She has a huge heart and I believe we share a lot of the same values and ideals which makes her the perfect person to guest post on It’s Just Life. Did I mention she is an author? Jackie’s book The Subway Chronicles: More Scenes from Life in New York had me enthralled and hoping I would run into some of the characters she has met on the New York subway. Today I am thrilled to have her share one of her new features on her blog with us—SHINE. I think you will agree it is a perfect fit for It’s Just Life. Joy Southard is one of my favorite people on the planet. True, I haven’t met all of the people on the planet, but if even if I had, I assure you, Joy would still be at the top of the list. We met a few years ago when I interviewed her for an article I was writing about the program she runs in Texas. Through her example, I uncovered one of the most valuable life lessons I would ever learn. Joy walks into the school auditorium and approaches the front of the room. The students, mostly fourth graders, chatter excitedly and fidget in their seats. Joy has brought a special guest with her today. His name is Quincy. Quincy has salt-and-pepper, curly hair that sticks out in all directions, not unlike Albert Einstein. He is short and sturdy with caramel-colored eyes that seem to know what you’re thinking. As soon as the kids see Quincy, they shout with glee. He is used to this kind of adoration. Quincy travels around Texas teaching lessons about compassion and self-esteem. And he does it without uttering a word. That’s because Quincy is a dog. Joy is the director of Healing Species of Texas, a compassion education program taught with the assistance of rescue dogs like Quincy. 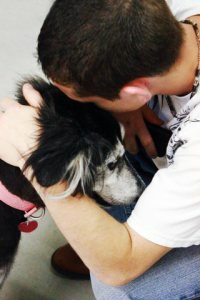 The dogs in the program have lived through abuse or neglect. They are examples to children about how to approach life issues with courage, empathy, integrity, and self worth. Joy doesn’t shy away from the dogs’ sad stories. By honestly telling what happened to the dogs, the kids can find understanding, respect, and, most of all, hope. The dogs made it through, and they can too. 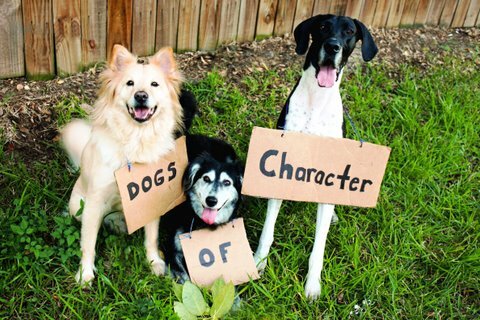 One of the school programs Joy organizes is called Dogs of Character. It’s an assembly presentation of three dogs and parallels their stories to a child’s experience. “We compare the feelings of a new dog at the dog park to that of a new kid on the playground. We bring dogs who have amazing loyalty to each other, yet are characteristically very different, to teach diversity and tolerance,” Joy says. Joy has many great stories from her work so I asked her to share one. “One of my favorite stories was a class of kids in a juvenile detention center. We teach the quote by Albert Schweitzer, ‘Until man extends his circle of compassion to include all living things, he himself will not find peace.’ In this lesson a young boy went up to our board and drew a stick figure with a sad face inside a circle. He explained that he is putting this boy, who he had bullied for most of the year, in his circle of compassion. His sad face indicated his tears. He told us he was going to apologize to this boy and keep him safe from others who would bully him. That was pretty meaningful to us because we later learned how our student kept his word and was ridiculed for sticking up for the kid who was a target. Because of Joy and the work she does, I am absolutely sure of one thing: compassion is key. To be able to look at another living being and think “you matter” is one of the most important life lessons of all. Jackie Cangro is a writer, fiction editor, and blogger. She writes a series called SHINE about people like Joy doing great things in their communities. If you or someone you know has a SHINE story to share, please let her know. Thanks, Jackie, for the great post today and for sharing Joy with us. Please let Jackie know how much you liked this post by leaving a comment for her in the comment section. You can visit her blog by clicking here. The bullies of the word must be stopped, especially in regard to children. Interesting that this is in TX. What a great and much-needed project with an innovative approach to dealing with bullies. It is an amazing program and I know that lives are being changed so that is a wonderful thing. So happy to have Jackie joining me today. What a great program! Compassion needs to be taught and practiced! I totally agree!!! Thank you so much for stopping by. Yes! Compassion is an important skill. One that needs to be learned and practiced. Thanks for your comment, Patti! What a great program. Kids are so reachable and teachable through animals. Adults, too, for that matter. Thanks for sharing. Thanks for stopping by and sharing. I love places like this and people like Joy who are making huge differences with their work. Fantastic program! And I love Jackie and so happy to see her here. Happy holidays! She is fabulous!!!! I am thrilled to have her join us today! Thank you so much for inviting me to post on your site, Beth Ann! I’m honored to share the important work that Joy is doing with your readers. Thanks for your wonderful post, Jackie. It is a perfect fit for It’s Just life! Awesome program and much needed! I did programs in schools for 13 years and believe me, students need this kind of encouragement. Agreed! It is an amazing way to reach out to kids. Thanks for what you have done!!!! Thanks, Jackie, for sending me here. I like the sentence, “The dogs made it through, and they can too.” I’ll remember that. Thanks for coming by!!! Come back often!!!! Thank you so much for stopping by. I’m glad that Joy’s work resonated with you. Ha ha, I can see why the Einstein reference now. Quincy is adorable. I bet, he has that look in his eyes. He knows he is the star of the show.. I really enjoyed reading what Jackie is doing to help children. So many have problems at home and need some help. God bless you Jackie. This program is amazing, isn’t it? I love what Joy is doing. How true this statement is! Thank you both. This is something that has changed my outlook on life, Darla! Thank you very much. Thanks so much for stopping by! I am thrilled to meet all of you guys! Sharing the love for Joy and all that she does! Compassion is the key. I love that (and completely agree). What a lovely post, Jackie. Thank you so much for stopping by, Julia! I’m grateful to spread the word about the amazing work that Joy and the entire Healing Species team is doing. Thanks for stopping by Julia!!! So wonderful to have all of Jackie’s friends come on over and leave a comment on this fabulous organization! 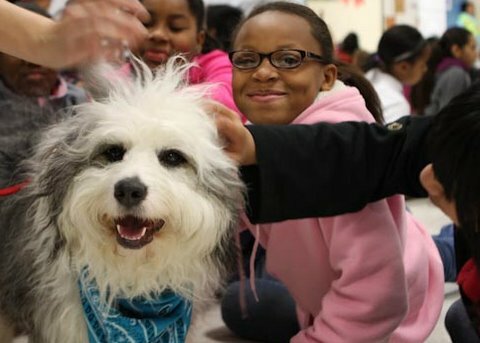 Everything about this program sounds like a win to me: children learning lessons about compassion from dogs who certainly wouldn’t be around anymore had they not been rescued. I love this! And Jackie, she rocks — along with her own wonderful rescue pooch, Reggie. Jackie does rock!! Thanks for stopping by and for leaving a comment! I love meeting all you guys! This is an amazing program. SHINE on! What a beautiful story, Jackie. Thanks so much for sharing it with us. I’m looking forward to learning more about this program! Thanks for stopping by, Natalia!!! Isn’t this an amazing story??? I am happy to be able to share it with you today via Jackie! Thank you for your warm comment, Natalia. Joy and her team do amazing work. I’m honored to share this story. What a wonderful program, to help teach our young children about bullying. Plus using rescue dogs to help teach compassion – rescue dogs make some of the best pets. Great program. What a wonderful post and program. Thanks for sending me here, Jackie! So glad that you stopped by, Carole. Hope you’re having a wonderful holiday! What a fantastic program. Teaching diversity, tolerance and compassion should be at the core of every curriculum. What a great pairing with our loving four legged friends. Nice post and a great share! What a great program. The dogs are adorable, and I bet the kids are too. The story of the bully turned protector made me heart warm. Teaching compassion is so important. Wonderful post, Jackie! Thank you so much for stopping by, Cynthia. I think it’s only been a recent realization that teaching compassion to children is as important as reading or writing. What a great program. The dogs are adorable, and I bet the kids are too. The story of the bully turned protector made my heart warm. Wonderful post, Jackie! What a lovely story, Jackie. Compassion empowers. Thank you. Thank you so much for stopping by!!! It is such a wonderful story, isn’t it? I am looking forward to having Jackie join me again in the future with more SHINE! Oh, Jackie. I love this. I especially love the Albert Schweitzer quote and how it’s applied to Joy’s work. And in an uncanny twist of fate – the dog in the photo with the blue bandana (Quicny?) looks exactly like a dog we reduced from the desert (She now lives a pampered city life). What a wonderful message — that through animals we can learn more about loving one another. Indeed. Thanks for stopping by, Melissa. Isn’t it a wonderful thing? I am so happy to have Jackie sharing this today. Look for more SHINE next year on It’s Just Life. Sounds like an incredible program and you are so great for shining light on these people who do great things. Thanks so much for stopping by, Nina. I hope to have more stories to share in the future.